Games User Research/Experience focuses on players’ psychology and their behaviour via techniques such as playtesting, analytics, expert analysis, UX design, and others. Game User Researcher and Experience professionals aim to help game developers deliver players the best gaming experience possible. Games User Research and Games User Experience is a core part of modern game development. The goal of Games User Research and of Games User Experience is to help game designers reach their design goals by applying scientific and UX design principles, and by understanding players. If looking at Games User Research, the practice of playtesting is probably the most well-known method of Games User Research. Playtesting is where a representative group of players are observed playing a game and detailed notes on their behaviour, both in and out of the game, are taken and compared against the designers intended behavioural responses. Observations can often be combined with follow up interviews or questionnaires to access data about players motivations, emotions, and thought processes to add additional depth, and help provide context, to the behavioural data. While playtesting is the best known method, there are other ways to understand players and improve the user experience. These include analytics (tracking player behaviour via data hooks in games), long term engagement diaries (where players report on game play experiences in naturalistic settings via a diary), biometrics (where player physiological data is recorded along with their behavioural and subjective data), User Experience (UX) design, and many others. With the increase of free-to-play and “games as a service” games and an increased focus on player-centered design, understanding the player and their experiences and psychology has only become more important over time. Finding and removing small issues in the User Experience, particularly if caught early by User Research and User Experience processes, can help create a well retaining and engaging game that puts the player at the center of the experience. 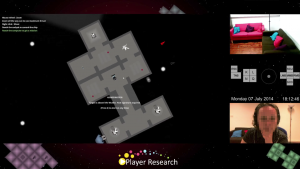 Games User Research is also an academic area which seeks to better understand what motivates players, how their actions can be explained or predicted, or even just to find new ways to capture and use data about players to help with game design. Games User Research relates to psychology, human factors and ergonomics, user experience design, interaction design, computer science, and many other fields. Games User Researchers in all of these fields, inside and outside of academia, come together around a love of gaming, players, and making awesome games. Pioneered by Atari in the early 1970s, Games User Research came of age in the 1990s at Sony with titles such as Crash Bandicoot 2, and later at Microsoft Studios in the USA, where Age of Empires was the first game it was successfully applied to. Now there are hundreds of Games User Researchers and User Experience designers working worldwide, particularly at larger studios and publishers like Activision, EA, Epic Games, King, Microsoft, Riot Games, Rovio, Scopely, Sony, and Ubisoft, as well as a number of smaller studios, in addition to several external UX/UR consultancies. Today Games User Research and Experience processes are carried out at all stages of game development, from pre-production all way through to post-release support. Since 2009 the IGDA GRUX SIG (previously the GURSIG) group has been instrumental in helping researchers around the world network and share ideas. The Games User Research SIG of the IGDA is the games user research and user expereince professional body, and has held an annual conference in San Francisco every year since 2010, following the foundation of the group in 2009. The first European conference was held in London in 2015. The SIG LinkedIn group is comprised of more than 1000 professional researchers, game developers, and academics, all aiming to understand players and help developers create the experiences that they aim to deliver. Understanding User Research: It’s Not QA or Marketing! Games User Research Summit Presentations. This page updates with full videos of presentations from the annual Games User Research Summits, dating back to 2010. Where experts from all over the industry come together to discuss and share new findings in Games User Research. GDC: UX Talks. Full videos of talks from the GDC UX Summit. Game UX Summit 2017 and 2016. Full videos of the talks from the 2016 and 2017 Game User Experience Summits. This series of videos from Games User Researchers describing what Games User Research is. The Twitter account @GamesUR, which shares games user research-related articles weekly. The Games User Research book. This book, written by prominent members of the Games User Research profession aims to explain what Games User Research is and give actionable examples of best principles and methodologies. The Gamer’s Brain: How Neuroscience and UX can Impact Video Game Design. This book is designed to equip readers of all levels, from student to professional, with neuroscience knowledge and user experience guidelines and methodologies.